CALAMP GUARDIAN wireless modem and analog radio VHF 136-174 MHz, UHF 406-512 MHz, 10 Watts, 19200 bps. Vanguard 3000 Multicarrier 3G cellular router for GSM, CDMA with WIFI and GPS optional. Vanguard 400 industrial cellular router, CDMA configuration, PXS8, 3G , serial only. 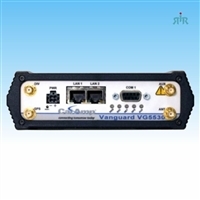 Vanguard 5530 multi-function router, 4G/3G LTE, cellular WAN, WLAN, Ethernet, optional WiFi, GPS.